At WMH our surgical team is committed to providing compassionate, patient-centered, quality care. We understand decision making can be stressful whether it be for yourself or a loved one. Our goal is to assist you in making informed decisions and providing excellent care in a professionally staffed, state-of-the-art facility. 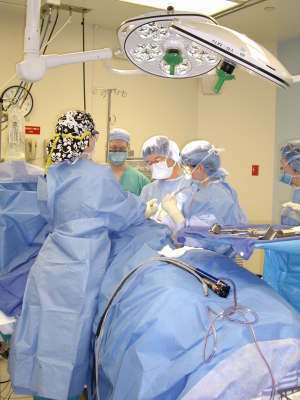 Our surgical team is comprised of the finest surgeons, anesthesiologists, and Certified Registered Nurse Anesthetist. Our team also includes a Nurse Practitioner First Assistant, specially trained Registered Nurses and Certified Surgical Technicians. Surgical Specialties provided include general surgery, diagnostic and therapeutic endoscopies, ophthalmology, orthopaedics, obstetrics and gynecology, urology, pulmonology, spine, bariatric, and our most recent addition ENT services. On average we perform 5,600 cases annually with 80% of them on an outpatient basis. Elective surgeries are performed Monday through Friday from 7:15 a.m. to 5:00 p.m. The department maintains a full complement of emergency staffing 24 hours a day all year. Scheduling and pre-screening appointments are made through your referring physicians office.